All the images here were taken with our Pentax K1000, body No.7612104. Apologies in advance, this page has become quite a travel album. 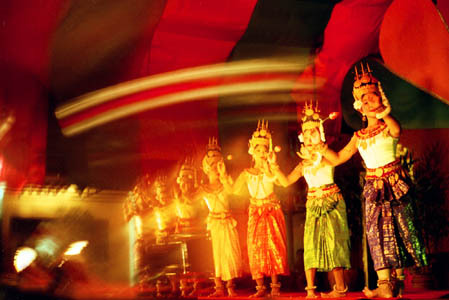 Vietnam is a name that still conjures up images of an ill advised and ultimately futile war. I have been extremely fortunate to drag both the museum Pentaxes around this country that, whilst filling me with ambivalence, never fails to saturate the emotions and senses. 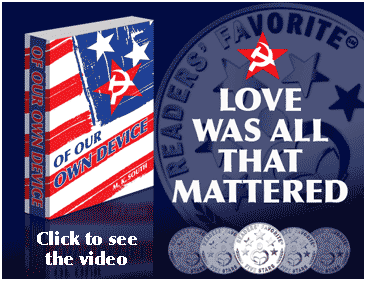 Modern Vietnam is a communist state following what might be best described as market Leninism. 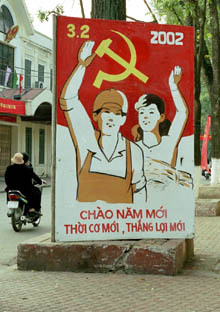 On my first visit in 2002, the capitol, Hanoi, was festooned with these hand painted public notice posters as it was the lead up to Tet (new year). Very typical of the genre of communist social 'feel good' artwork. 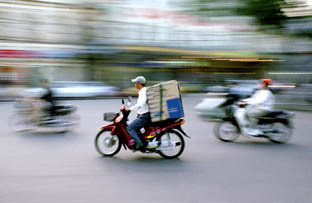 The cities are crowded and heave with the hustle and bustle of literally millions of small motorbikes, bicycles and increasingly, cars. The country must have been built on the back of the ubiquitous Honda Cub, for I've witnessed this motorized zebu carry all manner of grossly oversized loads including a coffin! Modern Vietnam relies heavily on the Honda Cub/Wave and increasingly on Chinese clones, but bicycles are becoming rarer with each passing year I visit. 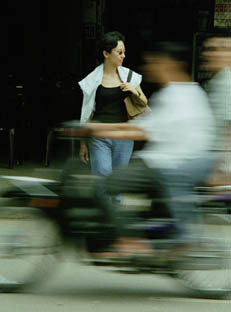 Crossing the busy city streets is an art, requiring a certain amount of trust from all parties. The accepted norm is simply to walk out into the traffic at a predictable constant rate, the traffic will pass around you harmlessly. No one seems to mind as it's almost expected. The US war, as it tends to be referred to, is never far from sight. It's impact upon the country's people, ecology, politics and psyche is an ever present reminder of the events that concluded with the Communist North taking the US supported South in 1975. 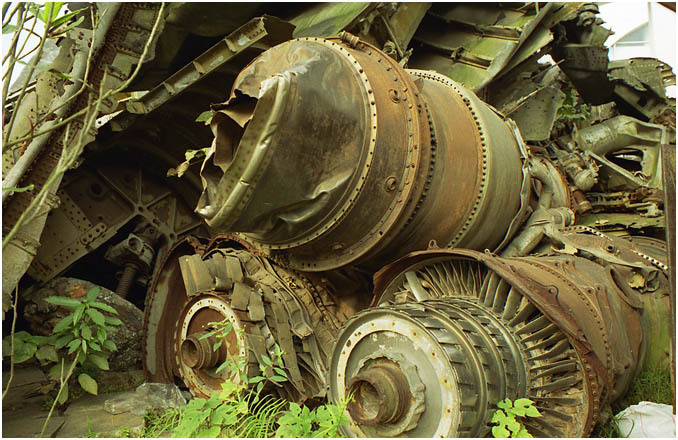 The defeat is for me illustrated here, by the contorted and smashed remains of these once impressive Boeing B52s. 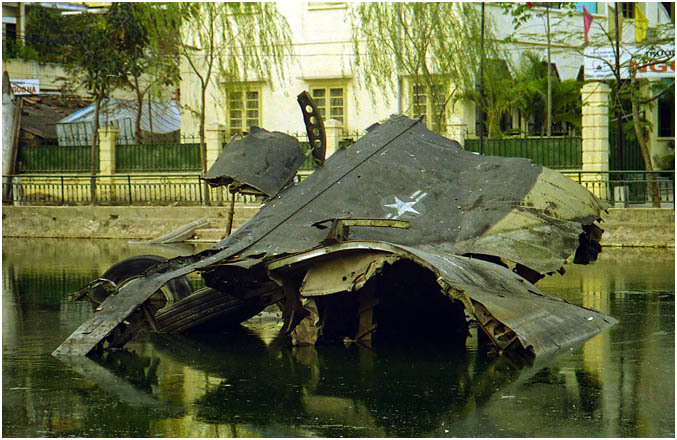 The wreckage still lies incongruously where it fell in 1972 - in the middle of the flower market pond in Hanoi, brought down by a surface to air missile. It appears to be a large section of fuselage between the tail and wing root junction and contains the aft landing gear. The other pictures show other B52 remains piled high elsewhere in the city, it was a little too precarious to look for serial numbers to ascertain whether of not the wreckage is from one 'plane or several of the eighteen B52s lost over Vietnam in between December 1972 and January 1973. In the South of the country in Ho Chi Minh City is the formerly named 'Museum of American War Crimes'. The name has been softened in recent years and there is an exhibition of the work of the war photographers from both sides of the conflict which serves to demonstrate the enormous power of the humble still camera in skilled hands. If you can picture in your mind the famous image of the little girl, Kim Phuc, running towards us after the napalm bomb strike, taken on 8th June 1972, which over 30 years later is an illustration of that power. I re-discovered some of the negatives from this trip in 2018, and decided to re- scan them at the size I now use. 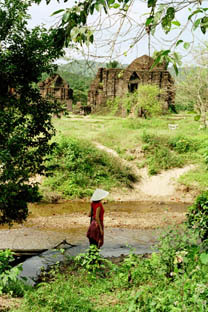 Agriculture occupies large part of Vietnam's working population. 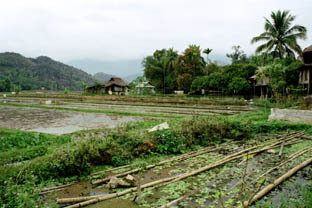 Where rice is grown, it's the wet type grown in paddies in a way that hasn't changed in centuries. In the central and Northern parts of the country water buffalo are still used with traditional wooden ploughs, as illustrated by this farmer walking one of these benign creatures back from a paddy with a plough slung over his shoulder. 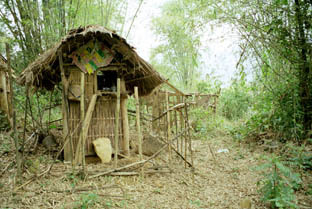 Left, in a Black Thai ethnic race village in the North is this cemetery, where the graves take the form of houses - complete with garden fences, a roof and even miniature furniture with a dinner service. 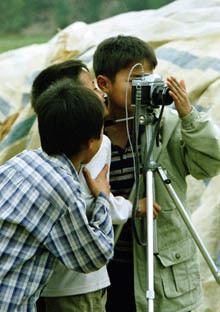 At left are three Black Thai lads having a good look at our other Pentax K1000. 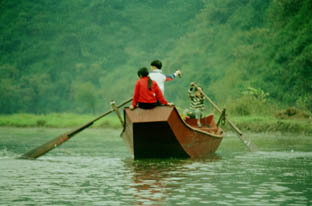 Vietnam is criss crossed by countless rivers and tributaries, consequently boats have, and still do, figure heavily in transport needs. Top left, these shallow draught, flat bottomed, wooden river boats are returning empty from a trip to the Perfume Pagoda in the North of the country. 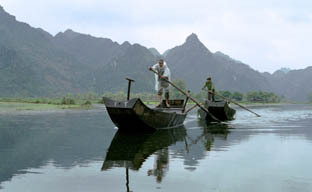 These two boats represent the trucks on this river and are often loaded so heavily the gunnels are barely above the water. The wooden ones are gradually being replaced by steel versions, top right, but following a very similar flat bottomed design, necessitated by the shallow rivers. Now, I wonder how many people in the west would let their kids play with a boat this size, no worries, the girl appears to be in charge. 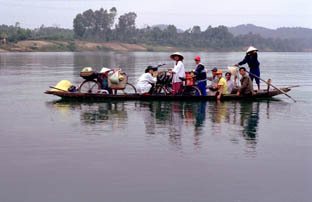 Not far from the old capital, Hue, in central Vietnam a river ferry carries all manner of goods from one side to the other, including ten people, two bicycles and a Honda Cub motorcycle. 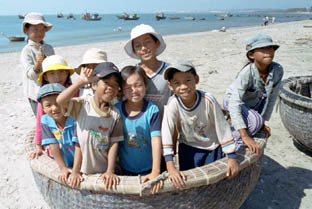 The bamboo conical hat is still worn in rural areas as it has for centuries. The reason we have their complete attention is that the captain of the boat I am on is about to pass just astern them at considerable speed. Viewing the original enlargement reveals ten very worried expressions, even though just a passenger I still feel guilty to this day. 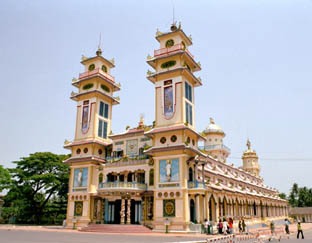 This colourful Temple is the seat of the Cao Dai sect at Tay Ninh in the Southern Delta area. Services are conducted every six hours and the faithful should ideally attend all. The converging verticals in the photograph demonstrate rather well what happens when you angle a standard camera up to get in a tall structure. 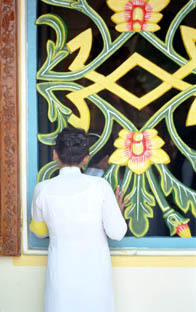 A follower peering through one of the windows at a service being conducted inside. Trying to find wildlife in Vietnam to photograph has generally proved frustrating, all the big animals were hunted by the French colonials and the subsequent conflicts to oust first them, then the US and allied forces wiped out virtually everything else. 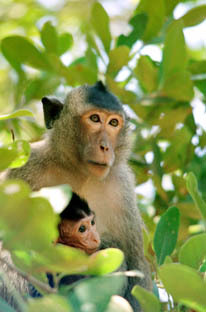 However I did find these canny little monkeys running wild in the Delta. 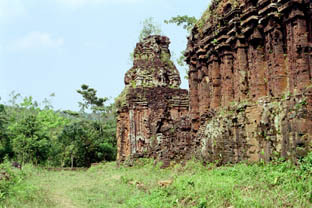 The religious site at Mai Son 60km South of Da Nang built during the Cham dynasty. The Chams were incumbent between the 4th and 13th centuries, My Son being the religious centre until the 10th. Many of the original buildings associated with this site were wood and rooted away long ago during the 6 centuries since abandonment following the invasion by the Viets in 980. 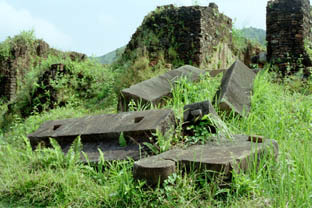 The site also suffered the attention of B52s during the 1969-1975 war and the area was extensively mined. My Son is an attractive site, slightly overgrown and not overly manicured, which gives the impression of just having stumbled across it. Construction was of locally produced red brick covered in stucco. Most of the latter has peeled of over the centuries. For ornate doorways large stone uprights and lintels were carved from solid stone, the mortice and tenon joints of the this collapsed doorway, bottom left, are beautifully formed. 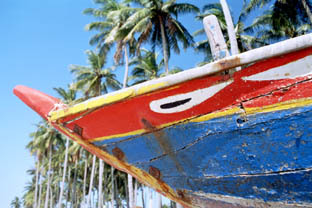 In late December 2005 our trusty Pentax K1000 was treated to a motorcycle tour of Northern Thailand. The need to travel fairly light meant that only one of K1000s could go along with a handful of the smaller members of the Living Image Camera Museum. The tour was organized by Asian Bike Tour who were fantastic. 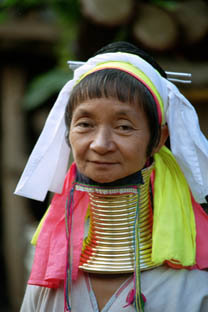 Ma No, a member of the Burmese Kayan people colloquially known as the 'long necks' owing to the displacement from progressively stacking these brass rings over the neck. 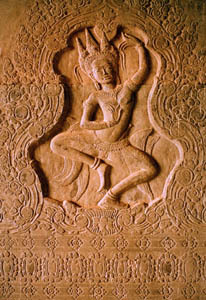 The practice derives from the once held belief that it protected from Tigers. 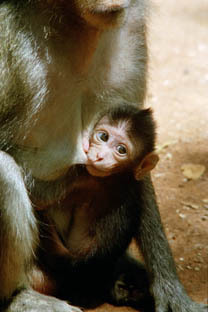 Ma No lives in Thailand in her village a short distance from the Thai town of Mae Hong Son close to the Myanmar border. 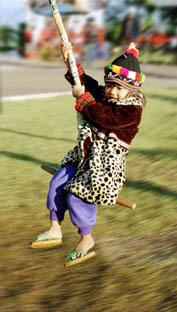 A little Hmong girl swings delightedly on the tribal swing erected in the market. This was a lovely moment to witness, in this troubled world a simple swing served to remind me that despite, ethnic, religious and geo-political differences we are all human. 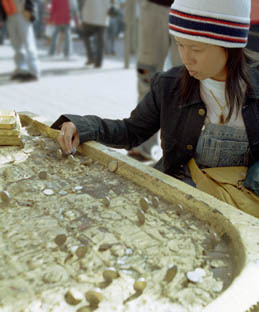 Outside the temple is this symbolic representation of the Buddha's footprint onto which the locals balance coins on their edges, an activity requiring some patience as the surface is far from even. 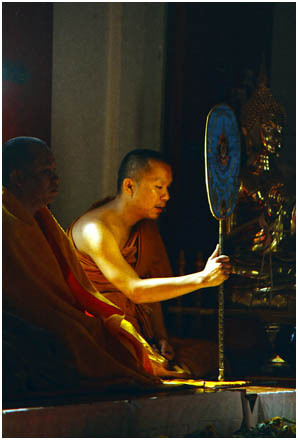 A Buddhist monk bathed by sunlight reflecting off gold in the Temple of the Buddha's footprint. 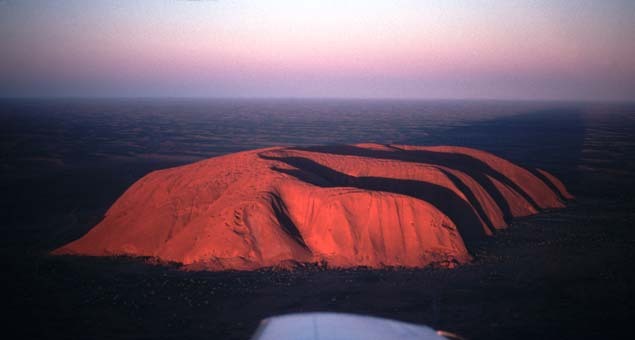 Aerial view Uluru, or Ayres Rock as it's more commonly known. 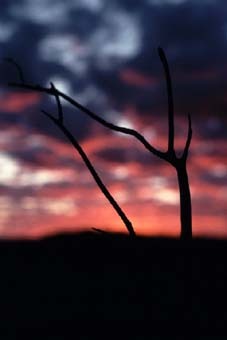 I was struck by the shadow disappearing into the distance as the sun set. The red colouration comes from iron oxide, apparently if it rains heavily the rock gets washed off and becomes a more normal "rock" colour, but then rusts back to this colour shortly afterwards. 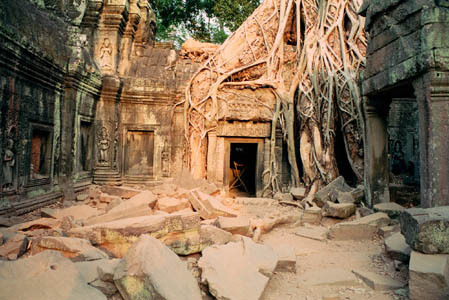 Of the many sites that constitute Angkor...and the site covers some 50 square miles, without counting the satellite ruins, Ta Prohm is my favourite. 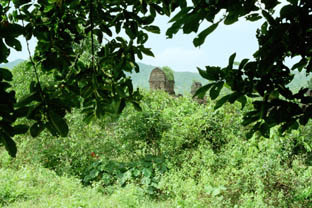 Left in a wonderful tumble down state, with fig trees grappling the ruins in a death grip, the site evokes romantic notions of stumbling across the place as it might have appeared in the 1860s, when it was rediscovered. 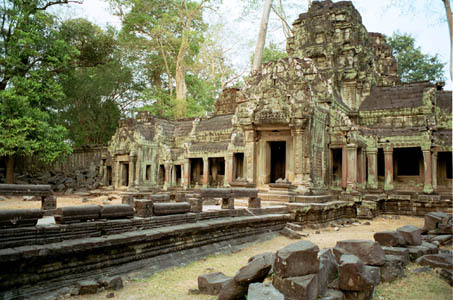 Though much smaller than the more famous Angkor Wat, it follows established practice with concentric four sided walls, a moat representing the sea and the central Temple Mountain. One corner of the almost impossibly beautiful Ta Prohm site, a fig tree perched precariously on the roof of one of the many corridors. As with many of the images taken here, a great dal of patience waiting for the tourists to clear was required, to give the appropriate abandonned feel. This image taken with the K1000 on it's first visit in 2002, it returned again 2007, by which time the place was significantly busier. 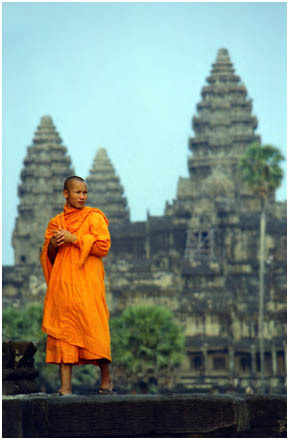 A Budhist monk's robes glow in the late evening light as the sun sets on the Angkor Wat Temple Mountain, in 2002. 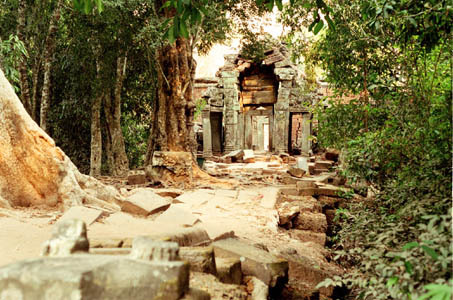 Though technically re-discoverd by the French in the 1860s, Angkor was never actually fully lost, as the overgrown and diminishing ruins were apparently continuously occupied by a small band of Buddhist monks since the ancient capital was abandonned. 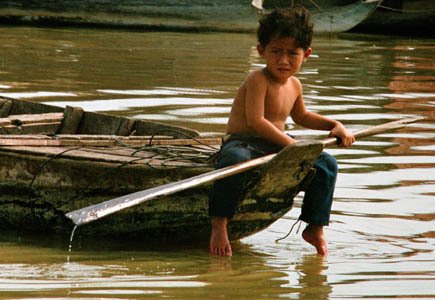 Below, one of the smaller residents who live on the floating villages of the Tonle Sap lake in Cambodia. This Pentax K1000, was a constant companion on trips, and has accompanied me of every one of my trips for 20 years, I rarely found it wanting under any conditions that I am prepared to take pictures in. It operated faultlessly in temperatures of 42ºC in South East Asia down to -14ºC inside the Artic circle. It was retired in 2010 when it started to show symptoms of capping.